As many of you know we have planned our 40th reunion for Oct. 10,2015. 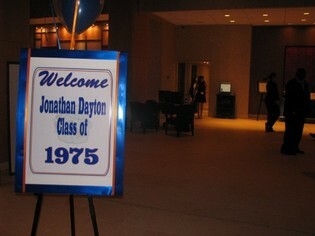 It is going to be held at the Hyatt in Morristown, where we had the last reunion. Because of this special package, the Hyatt needs a substantial deposit. We are offering an “early bird” discount for those who register and pay in full by July 1st. After July 1st thru Oct. 1st payment is $135.00 per person. We will also accept payment for friends of the class of 1975 at the same rate—this includes spouses, significant others, siblings and friends. We WILL NOT honor any requests after Oct. 1st and there will be absolutely no payments accepted at the door. —Include your current email and cell contact information with your check. We are all really looking forward to seeing you in October. Hope you can make it for another unforgettable night. It's seems like yesterday, but it's coming up on 40 years since we walked down those hallowed halls of JDRHS. We have set the date of the reunion. It will be held on Saturday, October 10, 2015 at the Hyatt Morristown at Headquarters Plaza, from 7:00PM to 11:30 PM. A sumptuous buffet and an open bar will be included. Details to follow! We would like to thank everyone who attended the Reunion. The feedback we received is that everyone had a fantastic time. I hope those of you who couldn't make it this time consider attending the next reunion (sometime in the future). We did have two complaints: 1) The evening went too quickly, 2) There wasn't enough time to talk to everyone. Even though the Reunion officially lasted four hours (and spilled over to the lobby bar for another couple of hours), like all successfully events the evening came and went in a flash. I guess it's hard to catch up with everyone in a single evening after so many years have passed. The hardest part of putting the Reunion together was trying to locate everyone. If we were to do another reunion in the future, we won't have to go through that process again, but we need your help! As was announced during the Reunion, we paid the company that hosts our Web site to continue hosting it for another 5 years. Make sure to keep your contact information on your profile up-to-date (especially your email address). Also, keep your profile current, keep us informed about what your doing and keep uploading pictures since everyone enjoys seeing what everyone is up to.